Onimusha 3 is the third game of the Onimusha series. The story focuses on the returning hero, swordsman Hidemitsu Samanosuke Akechi, who is in his quest to defeat his nemesis, Nobunaga Oda, who wishes to conquer Japan with his army of demons known as Genma. However, Samanosuke changes places with a French officer from the future named Jacques Blanc, and both have to adapt to their new worlds to get rid of Nobunaga and the Genma. The game retains elements from previous games in the franchise including the use of multiple special weapons in order to fight enemies and absorb their energy to enhance the weaponry. This time the player primarily controls both Samanosuke and Jacques in separate scenarios. The two are able to exchange items in order to solve puzzles. The development from this game started after the release of the PlayStation 2 which allowed the team to work on a 3D engine to design 3D backgrounds. In order to appeal to the Western market, the team set this game in Paris and chose French actor Jean Reno to portray Jacques. Onimusha 3 has been generally well received by publications for video games. Most of the writer's praise focused on the improved controls and the use of a 3D engine that allowed better combat and visuals, respectively. The game also generated good sales with over 1.5 million copies sold as of May 2008. 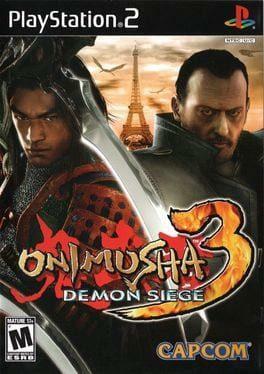 Onimusha 3: Demon Siege is available from 19.99 to 19.99 from 1 shops.